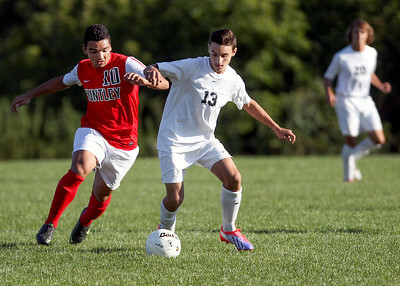 Sarah Nader- snader@shawmedia.com Prairie Ridge's Josh Reichert (left) and Huntley's Reyman Solis head the ball during the second half of Tuesday's soccer match in Crystal Lake September 24, 2013. 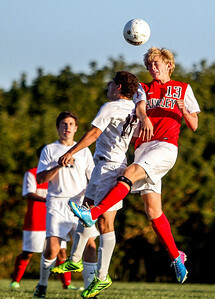 Sarah Nader- snader@shawmedia.com Huntley's Jack Bessey heads the ball during the second half of Tuesday's soccer match against Prairie Ridge in Crystal Lake September 24, 2013. Sarah Nader- snader@shawmedia.com Prairie Ridge's Adolfo Baca (left) and Huntley's Amir Dajani fight for control of the ball during the second half of Tuesday's soccer match in Crystal Lake September 24, 2013. 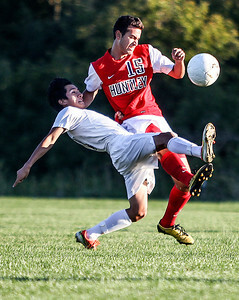 Sarah Nader- snader@shawmedia.com Huntley's Nikolaos Mihalopoulos (left) and Prairie Ridge's Dominik Chece run after a loose ball during the first half of Tuesday's soccer match in Crystal Lake September 24, 2013. 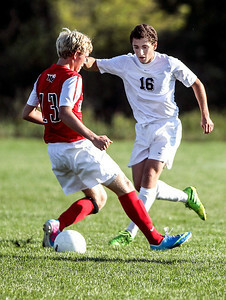 Sarah Nader- snader@shawmedia.com Huntley's Jack Bessey (left) is defended by Prairie Ridge's Sam Click while he brings the ball down field during the first half of Tuesday's soccer match in Crystal Lake September 24, 2013. 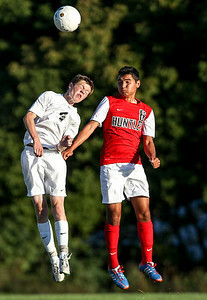 Huntley's Jack Bessey heads the ball during the second half of Tuesday's soccer match against Prairie Ridge in Crystal Lake September 24, 2013.